First is was the failed merger of BlueGreen Corporation (BXG) and now it’s chemical company Rohm & Haas (ROH) that is putting new pressure on the MANDA portfolio. The stock dropped over 20% today on news that take-over company Dow Chemical (DOW) lost a $17.4 billion joint venture with the government of Kuwait. Although the lost venture takes away important financing, the acquisition is not contingent on it. The transaction is fully financed by a one-year syndicated bridge loan and convertible preferred investments by Warren Buffett and the Kuwait Investment Authority. However, that doesn’t mean that the terms of the deal couldn’t be lowered. If that’s the case, I’ll most likely end up losing money on the trade. But I’m not going to sell the stock now because I believe that I’ve already lost as much as I think can be lost and there’s no where for the stock to go but up. I’ve been wrong before and I’m sure I will be wrong again but the mid-$50 range is a strong support level for the stock. (It’s been trading at or above $50 from the end of 2006 until just a month prior to the take-over announcement where it sunk to $45.) Also, Rohm & Haas management is committed to getting the deal done and most Wall Street pundits think it will go through. On the negative side, take-over company Dow Chemical was downgraded earlier this morning from overweight to equal weight at Barclay’s. The combined bad news sunk the stock to $15 representing a low not experienced since 1991. Ouch! Adding salt to the wound, open interest in Dow put options has increased which is typically a bearish sign. So, if any of you out there are considering taking a bullish position in either company, I strongly suggest to tread lightly and not commit an excess amount of capital to the trade. Note that if the merger does go through at the original price of $78/share, you will realize a whopping 45-55% return on your investment had you purchased Rohm & Haas stock today. In this case, the potential return just might be worth the initial risk. What is ironic is that of all of these mergers, I thought that this one would be less risky because of the large capitalizations and reputations of the entities involved, but if we’ve learned anything from the Bernie Madoff scandal, size and reputation don’t mean much anymore. Let’s keep our fingers crossed this deal goes off! Merry Christmas and Happy Hanukkah from all of the elves at the Stock Market CookBook! Here are the updated Manda Portfolio holdings and realized returns. The fact that 2008 has been a bad year for mergers and acquisitions is a “duh” type of statement, but the extent of withdrawn deals is noteworthy because it is unprecedented. According to a Reuters article published this morning, M&A activity is down 35% globally with over 1100 deals canceled which is 300 more than were canceled last year. Estimated total value of the withdrawn deals is around $800 billion with underwriting banks losing more than $815 million in fees. JPMorgan-Chase (JPM) and Goldman Sachs (GS) lost an estimated $73M and $64M in fees respectively. Guess they really did need a bailout. What changed my mind was the fact that ANL’s stock price has been steadily rising on much heavier than normal volume ever since the deal was announced. (Average daily volume is 83000.) Most likely this is the result of the terms of the deal which states that the acquiring company, private equity firm Green Courte Partners, must own at least 88% of ANL’s outstanding shares. This reassured me that Green Courte seems to be serious about the acquisition and gave me enough courage to buy the stock today. If the deal does go through in the next month or so as projected (keeping my fingers crossed), I expect to make a tidy 6.8% profit which translates into an annual return of roughly 80%. The current MANDA chart listed under the MANDA portfolio is not up-to-date. The return values don’t reflect recent dividends. It’ll be updated later today and include the addition of ANL. Last Thursday’s blog was devoted to the Santa Claus rally characterized by a year-end surge in stock prices. We saw that there does indeed seem to be a rally in stocks just before Christmas so I thought that I’d research this phenomenon further over the weekend in between my holiday cookie baking marathon. Using daily opening and closing prices for the past 15 years on the S&P 500 (which was as far back I was able to go), I was able to generate the following tables. Table 1 shows the price percentage gain or loss for the four trading days before Christmas Day (X-4 to X-1) and for the next six to seven days following it. Most years had four trading days in between Christmas and New Year’s except for 1993 and 1999 which had five and is the reason those two years have an extra data point. You can see from the table that there does seem to be a statistically significant rally for the two to three days prior to Christmas with the second to last day (X-2) outperforming the others and at lower risk (risk is given by the standard deviation). Table 2 summarizes several year-end trading strategies. 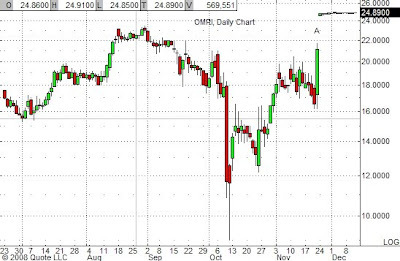 You can see that the market rallies 80% of the time for the three days before Christmas, gaining on average 0.64%. Even better is holding onto this position and riding it out until the close of the second trading day after Christmas (from X-3 to X+2). Here, the average gain increases to 1.12% and at lower risk to boot. Nice! These tables also show that as New Year’s approaches, the number of days closing in positive territory decreases. It’s reasonable to expect the last trading day of the year (X+4 in most years and X+5 in 1999 & 1993) to be down since that’s when most investors and fund managers exit the last of their losing positions. The first trading day of the New Year (N+1 in Table 2) is generally lackluster—possibly due to the hangover effect? But the day after that is a barn-burner, up over 0.5% on average nearly three-quarters of the time. Although there’s quite a bit of noise to these data, the fact that the market does rally over the Christmas holiday 87% of the time (only two down years in the past 15) is statistically significant. The best way to play it would be to enter a long position (S&P futures, index options or the SPY tracking stock) on the third or second trading day before Christmas with the intention of exiting near the close of the second trading day after Christmas. It may not be the perfect holiday gift but it’s a lot better than a lump of coal in your stocking! As a Christmas gift to my faithful readers, I was looking forward to doing a blog on the Santa Claus rally to see if there really was one. In case you don’t know what that is, the Santa Claus rally is typified by a surge in stocks that occurs in before Christmas to just after New Year’s. Explanations for this phenomenon include holiday-induced optimism, people investing their year-end bonuses, gift money, and the fact that the kill-joy Wall Street pros are off skiing in Aspen. So, is this a real rally? According to a web article published last year by the CXO Advisory Service, results of data collected for the day before Christmas to six trading days after Christmas showed little evidence for a Santa Claus rally; however, their data seemed to suggest abnormal strength just before Christmas as well as for a day or two after the New Year. I wanted to see for myself if their assertions were true so I went back and examined the chart of the S&P 500 for the days before Christmas as well as the days after New Year’s. Here’s what I discovered. I looked at the first trading day after New Year’s for the past ten years and found that there were six down days ranging from -0.1% to -2.8% (in 2001), three up days ranging from 0.6% to 3.3% (in 2003), and one day that was essentially flat (1999). The days following the first trading day of the New Year were evenly split with five up periods and five down periods. These data are not statistically significant. We can conclude that a pre-Christmas rally seems to be more than just a coincidence but there is no evidence from ten-year data to support a New Year’s rally. In yesterday’s blog concerning Washington, D.C. based REITs, I erroneously gave the stock symbol of Corporate Office Properties Trust as COPT. It used to be listed under that symbol when it traded on the Nasdaq but it is now trading on the NYSE as OFC. I have updated and noted the correction in yesterday’s blog. My sincere apologies for the error. This got me thinking as to how we, the taxpayers, can at least recoup some of the monies we’ll be shelling out down the road. Let’s see…tons of new jobs…in Washington, DC…people needing places to live, work, and shop…hmmm. Spelling it out like this, the answer is pretty obvious: Real-estate investment trusts (REITs) with a heavy emphasis in the D.C. area. Note that the D.C. conurbation is the nation’s fifth largest metropolitan area and third largest office market after New York and Chicago. Its office market has traditionally been stable since the federal government is the major employer. Real-estate cognoscenti are predicting that a turnaround in real-estate won’t be seen for at least another six months to a year or perhaps even longer. But with the Fed today promising that it will do whatever it takes to inject liquidity into the credit and mortgage markets, now would be a good time to start taking a look around the REIT aisle and readying our shopping lists. REITS, or real-estate investment trusts, are corporations that can be involved in many aspects of the real-estate market. As long as they pass on a significant portion of their income to investors (at least 90%), they are exempt from corporate taxation. REITs can operate in any or all of the following categories: industrial, office, retail, and residential. So here’s my list of REITs that have a strong presence in our nation’s capitol listed according to category. Boston Properties (BXP): The company has three major projects under development in the D.C. area. It leases over 8 million square feet of Class A office space in the Boston, Manhattan, and D.C. areas with about half that (4 million sq. ft.) in San Francisco and 2 million sq. ft. in Princeton, NJ. Fundamentally, it is outperforming its peers but the balance sheet is showing some quarterly cash-flow issues possibly due to several recent acquisitions. The company issued 4Q guidance above analysts’ estimates and is maintaining its current dividend. The dividend yield (D/Y) is 4.6%. Corporate Office Properties Trust (OFC)*: This REIT focuses on strategic customer relationships and specialized tenant requirements in the government defense IT and data sectors. Its properties are typically concentrated in large office parks adjacent to government demand drivers and/or in growth corridors. It owns 253 office and data properties totaling 19.1 million square feet, most of which is concentrated in the D.C. area. (It has much smaller holdings in Colorado Springs, Princeton, and Philadelphia.) It prides itself on providing technically sophisticated buildings in visually appealing settings that are environmentally sensitive, sustainable and meet unique customer requirements (many of its buildings are LEEDS certified). One potential problem I see with this company is that a Democratic-controlled Congress might well cut back on defense spending. (Congress is going to have to make some cuts somewhere to pay for all of Obama’s proposed new programs.) The company has been steadily increasing dividends for the past eight years. Current D/Y is about 4.8%. Brookfield Properties (BPO): The company owns, develops, and operates premier assets in the downtown cores of high-growth North American cities including New York, Boston, Washington, D.C., Los Angeles, Houston, Toronto, and Calgary. Its skyline-defining portfolio attracts major financial, energy and professional services corporations which have high credit ratings and maintain long-term leases. The company’s performance through the years is distinguished by strong, consistent financial results and a track record of steady growth. Currently, it owns 15 properties in the greater D.C. area. It’s raised its annual dividend since 2001 and now is paying a D/Y of just over 8%. First Potomac (FPO): The company invests in light-industrial properties of at least 50,000 square feet in the D.C. area as well as the surrounding Mid-Atlantic states. It was recently upgraded based on the belief it can continue to obtain financing due to the small size of its assets, management competency, and the expected continuation of acquisitions via joint ventures. A price target of $10 was put on the stock which ended today up almost 11% to $7.65. The company has paid a steady dividend since 2004. Current D/Y is a hefty 17.8%. Washington REIT (WRE): Although this company is classified as a retail REIT, it has a diversified portfolio of 89 properties consisting of 14 retail centers, 25 office properties, 17 medical office properties, 23 industrial/flex properties, 10 multifamily properties all totaling 12.8 million square feet. This is a pure play in the D.C. area since all of its holdings are located here. The company lowered year-end guidance citing equity dilution and delay in proposed acquisitions. Fundamentally, the company’s balance sheet isn’t as strong as some of the REITs in the other categories, possibly due to the downturn in retail, but it still has managed to increase its annual dividend since 1992. Current D/Y is about 6.1%. Saul Centers (BFS): The company’s portfolio consists of 50 community and neighborhood shopping center and office properties totaling approximately 8.2 million square feet. Approximately 80 percent of cash flow is generated from properties in the metropolitan Washington, D.C./Baltimore area. Revenues and income have been steadily increasing, although there was a small drop in the 3Q numbers. Dividends have been increasing since 2005. Current D/Y is 3.9%. Technically, the stock today broke through major resistance—a bullish sign. Most of the residential REITs that I researched operate across the U.S., but I did find one that is concentrated in the northeast, including substantial holdings in the D.C. area. I think that if there is an expansion in the D.C. area, the REITs that will benefit the most will be in the residential and office categories. Industrial properties could contract if Congress slashes defense spending, and unless consumers can be coaxed into opening their wallets, the retail markets could be lackluster as well. Some folks may object to the omission of Vornado (VNO) but I felt that even though it does have a significant commercial presence in D.C., it was just an average sized piece of its portfolio pie. Technically, REITs have been taking a beating along with pretty much everything else, but today’s Fed news could be just the spark needed to ignite the real-estate and financial sectors. REIT stocks zoomed up 10-20% today but is it time to buy? I think so as many of them took out major resistance. Even if the stocks do head back down, most of them are still trading 30-50% off their September values. Plus, they pay a nice dividend and none of the REITs mentioned here have reported a dividend cut–at least not yet. The time may be right to add some REITs to your portfolio. *Symbol correction (dated 12/17/08): This symbol was originally given as COPT. The company did trade under that symbol when it was listed on the Nasdaq. It now trades on the NYSE under the symbol OFC. My sincere apologies for the error. In general, exiting a trade is probably tougher for most investors than entering one despite the fact that there are many ways of doing so, either technically or quantitatively. Quantitative approaches include fixed stops that will trigger once a profit percentage is reached or trailing stops that follow the price and are triggered once the price begins to move against the position by a designated percentage. Technical criteria include trend-line violations or a reversal in a technical indicators. One such indicator that is particularly useful in determining exit points is a called the parabolic SAR. Once in a position, think of the dots as a type of trailing stop. From the charts below you can see that the dots are farther away from the price at the beginning of a move and tighten up as the trend continues. The position of the indicator is controlled by two variables: the step and the maximum step. If the step is set too high, the indicator will fluctuate more often and whipsawing will occur. The maximum step controls the adjustment of the indicator as the price moves. Lowering the maximum step furthers the indicator from the price. Wilder recommends setting the step at .02 and the maximum step at .20. Most charting services will allow the user to tweak these variables. The parabolic SAR works great in trending markets but is miserable during periods of consolidation. One way to minimize this effect is to look at longer time periods—a weekly chart instead of a daily chart, for example. 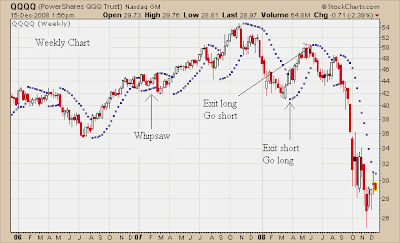 You can see from the charts of the Nasdaq 100 tracking stock, the QQQQ, that the parabolic SAR switched three times on the daily chart during brief consolidation periods that occurred from September to November, but this whipsawing is not evident in the weekly chart where the indicator has signaled a downturn since the beginning of September. This is not to say that using a longer time period is the way to go, either, for you do lose some accuracy when it comes to timing your entry and exit points. So what’s the solution? One way is to use other technical events like the breaking of a major support or resistance line or the breaking out of a base. Another way is to use other technical indicators for trend confirmation. Wilder himself estimated that trends occur only about 30% of the time and suggested using an oscillator such as his ADX (Average Directional Index) to determine the direction of the trend. Other indicators that can be used effectively are the CCI, the MACD, and moving average cross-overs. If your charting service doesn’t carry the parabolic SAR, you can find it at Yahoo! Finance and StockCharts.com which has a whole boat-load of charting tools along with an in-depth description of each and how to use it. Have fun! Everyone knows that events are what feeds the market, but how do these events translate into price movement? Any market technician is able to look at the chart of an unspecified company and give a fairly accurate history of the events that shaped its price profile. I know because I’ve wowed my friends with it, and by learning just a few market moving basics, you’ll be on your way to wowing your friends (and yourself), too. Parlor tricks aside, the main reason you’ll want to learn how to read a chart is to make you money, or at the very least, avoid losing it. In Recipe #5: News Nicoise, we list market moving events and identify ways to profit from them. Some events, however, affect price more than others. Here’s a list of events that generally have the greatest impact: mergers, earnings guidance raised or lowered, credit rating raised or lowered, analyst rating raised or lowered, dividends increased or decreased, stock buy-backs, and sundry corporate events such as accounting irregularities or abrupt changes in high-level management. There are also industry-specific events. For example, the success or failure of a clinical trial has the potential to make or break a fledgling biotech. One doesn’t have to look very far in today’s market to find stinky stock charts. 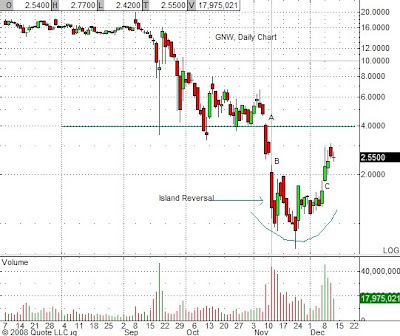 I selected the chart of insurance giant Genworth Financial (GNW) because it illustrates several major events. A. 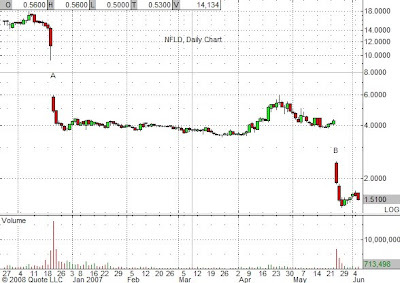 11/6 (after market close): Reports huge third quarter loss. Withdraws full-year guidance. Suspends dividend and stock buy-back program. The stock gaps down 14% the next day, dropping another 34% at the close. B. 11/10 (after market close): Moody’s downgrades the company’s debt rating. Next day, the stock gaps down 25%, closing the day off 40% from the open. C. 12/8: Proposals aimed at freeing up insurers’ capital are tentatively approved. This cheery news produced industry gains across the board. Genworth gapped up on the open, closing up 42% over the previous day’s close. This week, the stock has been in an uptrend and has closed the price gap triggered on November 11th. This is a short-term bullish move. Barring any other unforeseen bad news in the financial sector, we could reasonably expect the price to gain another $1.50 where it will have to fill the 11/7 gap at $4. I wouldn’t advise conservative investors to jump in until the stock convincingly clears major resistance at $5. 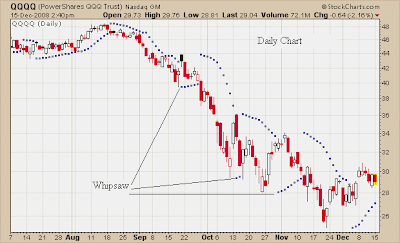 Note that an “island reversal” was formed between the 11/11 exhaustion gap and the 12/8 breakaway gap. Island reversals don’t necessarily signal a change in direction; they can signal the start of a consolidation process as well which is why I urge all but the speculative to wait until major resistance is toppled. A couple of years ago, a web acquaintance of mine was touting Northfield Labs (NFLD) as the next biotech giant based on their sole product called Polyheme, a red-blood substitute, that was still in development. So convinced was he of this company’s success that he not only convinced his relatives to heavily invest in it, he also TOOK OUT BIG LOANS (pardon my yelling) to buy more stock! Any reputable financial advisor would have had an apoplectic fit. Okay, you all know what’s coming here. Take a look at the company’s price movement between the end of 2006 through the middle of 2007. A. 12/20/06 (before the market opens): Preliminary results of a late-stage trial of PolyHeme show that it failed to meet the study’s primary goals and was shown, in fact, to be inferior to a saline solution. This announcement whacked two/thirds off the stock price in one day. B. 5/23/07: PolyHeme failed to show any significant efficacy in its Phase III clinical trial. The stock shed over 50% that day. Surprisingly, the company is still around but the stock is now trading around 50 cents, down almost 98% from its $23 high set at the beginning of 2005. On November 24th (point A in the chart below), Johnson & Johnson (JNJ) announced that it would purchase Omrix Biopharmaceuticals (OMRI) for $25 per share in cash. The stock immediately jumped up 13% on the open and has been trading in a very tight range since. I’m including this chart so you’ll know what a company that is being acquired looks like. Unless there’s some significant short-term money to be made on the transaction (see Recipe #13: Post-Takeover Tacos*), investors should avoid these. This is just the tip of the iceberg when it comes to technical analysis (TA). My purpose here was to show all of you scaredy-cat fundamentalists that TA is not Jamaican voodoo but more like the map of the mind of the investing collective. It’s really not that tough, and once you’ve analyzed a half a million charts or so, you’ll get the hang of it. In the next day or so I’ll be showing you how you can use a chart to quickly and accurately determine that slipperiest of fishes: the exit point to a trade. Google Finance provides stock charts with news flags that are described in an adjacent scrolling menu. You can set up this feature as well as adding dividend flags and stock splits to your charts via the settings tab. Nifty, no? *My MANDA (M & A) Portfolio is based on this recipe and Mario Gabelli’s ABC Fund operates on similar principles. You are currently browsing the Stock Market Cook Book blog archives for December, 2008.